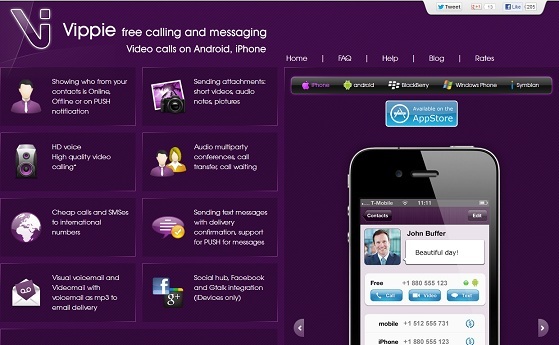 Vippie Voip Application : Viber and Whatsapp Alternative | Free Pc to Phone Calls, Free Voip Calls to India International ! Many of our blog readers are using Viber for voip calls on smartphones and Whatsapp for instant messaging and sharing pictures and other files. I am also a regular user of Viber and Whatsapp. But Viber is not available for all types of phone (specially viber blackberry application does not have all the features which includes free calls). Coming to whatsapp, it keeps on sending me alerts that soon it will cost me a dollar (which is already the case with iPhone). So I may have to think about using whatsapp on my android mobile. Who want's to pay for these feature's, when these are being offered for free by so many other voip providers. We are now looking for an application which is available for all (or most) types of devices (mobile phone), which is free and which has all the capabilities that are being offered by Viber or Whatsapp. Basically we want an alternative to Viber and Whatsapp. The search ends at Vippie Application, which offers free calling and messaging. Lets check out this app. VIPPIE is, arguably, one of the best VoIP service providers. Not so long ago, such services used to be offered by a handful of operators but not anymore. However, as the number of providers increased, the competition, the quality and advantages for clients have also skyrocketed. So with the advent of VoIP free pc and mobile apps, it has become possible for providers like VIPPIE to offer wide range of fabulous services. Now, and thanks to our feature-rich mobile apps, you can make cheap VoIP calls to any mobile or landline number, send SMS, and chat for free with all your friends, all over the world! There are many advantages for subscribing to VIPPIE. To mention a few, and additionally to the wide range of free services that VIPPIE offers you, like free calls, SMS, Free chat and File sharing, VIPPIE offers you the possibility to top-up your account online and benefit from an extraordinarily low rates for International calls. Who's (which of my friend) using Vippie : One you sign in your smartphone you will see immediately in your Contacts who uses Vippie. It also shows who from your contacts is Online, Offline or on PUSH notification. Free text message with delivery alert. Social networking integration. Google Talk, Facebook integration. You can even call people who are not using Vippie. It will cost you less than a regular call, because the app will use VOIP to do it. Therefore, if you want to be in touch with your friends for free remember to invite them to Vippie. Of course, you can also chat with your friends from Facebook and Google Talk for free using social hub. Vippie is designed to run also in the background (without draining your battery), so you will always receive incoming calls and messages notifications. Vippie will notify you about every friend who has just joined Vippie, too. Please note that in the countries where Voip is blocked (UAE etc), you will not be able to use Vippie. The main reason people want to make a switch from Viber and Whatsapp is because availability and cost on their phone. Lets check Vippie in this regard. What about Vippie for PC ? Well it turns out that they are developing their PC application (which is just like Viber). So till the time their official PC app is not available we will have to figure out something else inorder to use it on PC (may be android emulator will do the task). who will pay 14.99 $ ? ?